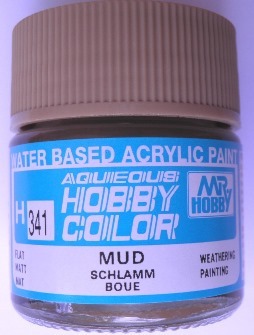 AQUEOUS HOBBY COLOR is a very safe paint which can be diluted with water, brushes can be washed in water and the solvent contained in the paint is very mild. It provides a glossy texture and very good leveling qualities (smoothness of coated film), so the paint finish in glossy colors is excellent. Mix with over 15% of H-40 Flat Base to frost glossy colors, or 5 - 10% for a semigloss finish. It is not necessary to dilute the product for brush painting as a basic rule, but when using an air brush, dilute it with 10 - 15% water or Aqueous Hobby Color thinner. As for the number coats, 1 - 2 coats are recommended when brush painting, and 2 - 3 coats when using an air brush.